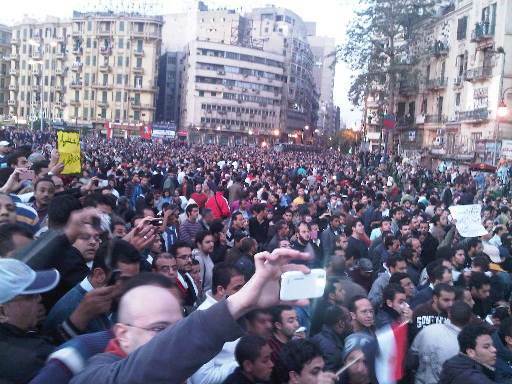 The Egyptian people have decided to communicate directly with the oppressive regime to demonstrate that they want it out. Having failed to deliver the message through the censored media, banned political parties and controlled unions, or even through the parallel media such as blogs, Facebook or Twitter, which the regime dismissed as kids fantasy world, the Egyptian people decided to set a Date for Revolt beforehand, and they kept that date. Yesterday, on Jan 25, Egyptians took to the streets in every city in Egypt in response to a call first launched on the Khaled Saeed Facebook Group and echoed in Twitter, other Facebook Groups and other new media channels and political movements. •	Ending Mubarak's 30-year tyrannical rule. •	Dissolving the rigged People's Assembly and dismantling the corruption network. •	Dissolving the government and forming a National Unity Transition Government to prepare for free and fair general elections at the nearest possible date. •	Prioritize social justice, or as protesters beautifully put it in their chants: "Bread, Freedom and Dignity for Every Egyptian. •	Releasing all political prisoners. The most repeated chant was one that did not rhyme, very unusual for Egyptian protest chants. Apparently it rhymed in the hearts of Egyptians. It went like this: The People -- Want -- the Regime Down ! The police used the most brutal force to crush the protests -- but people stood with their bare bodies to stop water cannons, armored vehicles and tear gas cannon vehicles. After around 10 hours of controlling Egypt's biggest square, tear gas and rubber bullets finally forced the protesters to leave Tahrir square, but many people marched throughout small streets and alleys of Cairo to deny access to armored vehicles till the early hours of this morning. I went home around 5 a.m. myself. Hundreds of people have been arrested. The police are even arresting injured protesters from the hospitals. Seven protesters so far have fallen dead, most of them from Suez, where the police seemed to use live ammunition. But Egyptians are waging new waves of protests today and declared the 28th to be Friday of Anger, determined not to rest or be deterred till their basic demands are met. This is a revolution of the people. Average ordinary Egyptian faces everywhere. Young men, women and children from all ages. Although the Muslim Brothers and the official parties announced that they will not participate, individuals from all parties joined. But the protests were as spontaneous as they were peaceful and civilized; on the part of the protesters, that is. El Ghad Party had announced at an early stage that it will participate at every city, town and village where it has members or supporters. The 6 of April youth movement, DFP and some socialist movements also were key ingredients. Many ordinary people, but also people from El Ghad and other movements were arrested yesterday, including Nour, Ayman Nour's son. This is a living proof that when the people decide to take matters into their hands, there is no stopping to the will of the people.